Blood Bowl 2 is the flashiest iteration of the game so far, but its dice rolls are frustrating, and its ample ruleset isn't introduced well to newcomers. Board game night is my favorite setting for yelling at friends and eating food I’d be ashamed to order alone. Weighty dice rolls have a cozy home in the place between late night pizza and friendly banter—they’re a conduit for chaos, some high-level thought undermined by easy drama. But when a board game is removed from its intended context, it becomes something else completely. Blood Bowl 2 is emblematic of this problem. It may be reputable as a board game, but despite the slick, playful presentation and thorough online league modes, it loses a lot in translation. 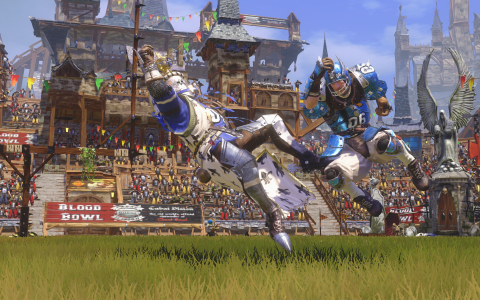 Blood Bowl is a turn-based fantasy board game that loosely resembles American football. Teams pulled from the Warhammer races do a lot of punching, grunting, and bleeding, just never enough to fill an entire stadium with their blood, thank goodness. Functionally, Blood Bowl is fairly simple. Players position their athletes similarly to football players on the line of scrimmage. You take turns performing up to one action with each athlete, often moving, blocking (which is essentially tackling), and passing. Each athlete has a specialization, meaning their stats allow them to move further, make them stronger, or give them special abilities that come into play on specific die rolls. Notably, the ball isn’t reset after every turn—one half is just a single football play drawn out over the course of eight turns. You’re encouraged to tackle, maim, or kill anyone, whether on offense or defense. My favorite component of Blood Bowl 2 is evaluating player movement. It’s simple strategic fun. Positioning athletes together grants stat bonuses, so building clusters around players you want to protect is encouraged. Conversely, breaking through these clusters opens up holes in the opponent’s defense, which allows for ball carriers to fly through or makes passes easier to complete. If you understand the basics of American football, it’s fairly simple to intuit. Blood Bowl just doesn’t have a great way to teach its abstract, abundant rules. The campaign functions as a jarring, drawn out tutorial accompanied by some obnoxious commentators . During the first few games, the focus is on player positioning. It’s actually impossible to fail routine actions, like picking up the ball or short passes. However, no obvious indication is made that anything has been stripped from regular play. My first hours were spent in a naive bliss. Attempts to open up the line, plug holes, and set up passes weren’t 100% successful, but felt plausible. I was starting to plan more moves ahead, I was able to react swiftly, and a real sense of tactical depth washed over. It felt as if I was playing a spiritual approximation of football, and it felt good. The bliss was short lived. Game after game introduced new rules that fundamentally changed how I played. Dice rolls were injected into nearly every action, failure to perform an action ended your turn, players could get injured and die inexplicably, and time limits were imposed. During one game, the ref was bribed by my opponent, and would tackle one of my players every few turns. Neat. What I thought was a purely tactical game with light elements of randomness was actually almost wholly dependent on dice rolls—most of which are invisible to the player—and not for the better. My best laid plans were usually upset by bad rolls during menial actions. Whether moving a player, picking up a ball, or attempting a short open pass, everything has a chance to fail, and once it does your turn is instantly over. This starts a frustrating loop: I evaluate the field, make a plan, execute, and trip up. My opponent often does the same. The result is an amorphous mess of players on the board, hardly representative of genuine football tactics and instead an impromptu trade of slapdash reactionary movement. This isn’t to say Blood Bowl 2 is devoid of intentional player input. A more practiced player is going to have a greater sense of how to manage risk, and the game will reward that behavior. But even the least risky moves are subject to fail, so whether I botched a simple move or pulled off a miracle play, I had a hard time figuring out if it was because of my management skills or plain luck. There’s still no immediate way for new players to hop in and feel viable. Blood Bowl 2 depends on uncertainty to approximate athletic error, but limiting my chance to pick up the ball to a six-sided die feels incredibly reductive. Marshawn Lynch isn’t going to fail to pick up an uncontested ball 43% of the time. How these percentages are determined isn’t made apparent either. I had to dig through the online rule book to figure out a roll was happening behind the scenes. Sticking to the original rules may serve the existing audience, but it just feels antiquated and arbitrary for a newcomer. It’s possible to spend weeks in the online league mode, playing in an array of tournament modes with players of a similar skill level, building a decent team from the Transfer Market—a place where you can buy and sell athletes—but there’s still no immediate way for new players to hop in and feel viable. It’s arguable that Blood Bowl 2 is meant to be experienced this way, that a rough start is part of role-playing a team of amateurs, but long term grinding for a statistical advantage just doesn’t sound fun. And returning players might feel restricted too. The last iteration of Blood Bowl on the PC expanded its roster to 23 playable races, but Blood Bowl 2 scales it back to eight. Blood Bowl 2’s loyal player base makes me worry that I’m missing something special, and I just have to put weeks and weeks into finding it. Maybe the chaos and seemingly intentional imbalance are part of the charm, a direct response to Warhammer’s more stringent board game brethren. Fact is, the basic pitch is kooky, turn-based fantasy football, but what’s actually there feels needlessly convoluted and difficult to parse for newcomers. If you have a group of disparate friends really into Blood Bowl, then rejoice. This is a shiny, featured expression of the board game. If you haven't already spent late nights rolling dice with the physical version, expect to be confounded and frustrated with plenty of desk to forehead contact. Wearing an actual football helmet might be a good plan. Just a bit more and we can fill the bowl. The grid represents my player's move capability. Squares marked with dice allow me to move further, but at the behest of further rolls. This guy is a pretty big jerk. How a player's strength matches up with another determines how many action dice they get to roll. The opponent split my line here and can pass through without performing a dodge roll. Playing as non-human teams is most interesting since they usually have the most unique play styles and look fairly disgusting. League play let's you join other players of a similar skill level in scheduled, variable bouts. One more peek at the Cowell Pounty Wardens.